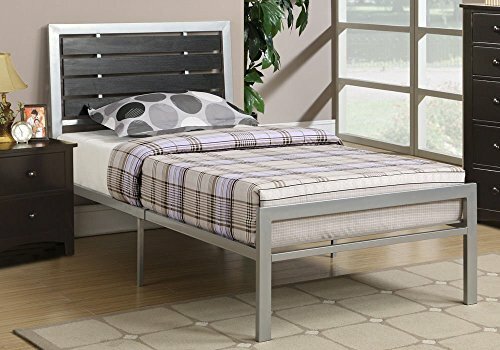 Modern youth kids simple twin or full bed silver metal frame plywood headboard compose a modern bedroom for a youth or guest room that features a paneled headboard framed in silver, and complimentary storage units. Bed available in a twin or full size. Product specs: Twin bed or full bed material: Metal & plywood HB silver finish some assembly may be required. Dimension (approx.) bed: HB 40"h, fb 18"h order content: 1 x bed.